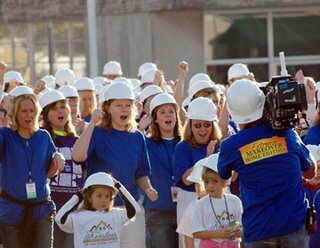 Extreme Makeover – Home Edition is in St. Meinrad! 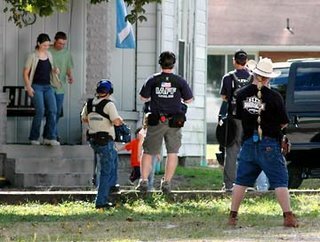 Filming began Monday, September 25, in St. Meinrad, IN, for an upcoming episode of the reality TV show, “Extreme Makeover: Home Edition,” which airs on Sunday nights on the ABC network. Show host Ty Pennington showed up on the doorstep of the Shawna and Steve Farina residence, just two blocks from Saint Meinrad Archabbey, to announce that their home had been chosen for the “Extreme Makeover” show. Shawna is a former employee of the Archabbey. At 27, she has been battling breast cancer for the past year or so. The Farinas and their three children left a few hours later in a black limousine for a week-long vacation. Meanwhile, local contractors and volunteers will be tearing down their house and building a new, larger one in its place. One of the first projects Monday night was to tear down The Shady Inn, which has sat unused for several years, to provide a larger building site. Many alumni will remember this “hangout,” which was located across the street from the post office. As one of the neighbors in the community, Saint Meinrad Archabbey has been enlisted to help with some of the TV program’s logistics. Several parking areas have been turned over to the show for the week, while the Abbey Kitchen and Bakery have agreed to supply some sustenance for the work crews. In addition, monks, students and co-workers will likely be among the hundreds of volunteers who assist with the project, which began with the demolition of the Farina home on Wednesday morning. During the “Braveheart” demolition scene, shown during every episode, hundreds of blue-shirted, hard-hatted volunteers surged forward to take down the house in record time. Photo: Steve and Shawna Farina leave their home for a limousine ride to the airport for a week’s vacation with their children. There is more information available at the contractor’s website. Or you can view a slideshow of pictures of the demolition! I have volunteered to move furniture in to the completed home on Sunday. It just started raining here about 30 minutes ago, so I hope it doesn’t slow them up too much.